Dr. El-Bogdadi is board certified in internal medicine and rheumatology and a Fellow of the American College of Rheumatology. He graduated from the University of California, Irvine with a B.S. degree in biological studies and received his medical degree from The George Washington University School of Medicine in Washington, DC. He completed his internal medicine training and his rheumatology fellowship at Emory University in Atlanta, Georgia, where he also served as an Instructor of Medicine. 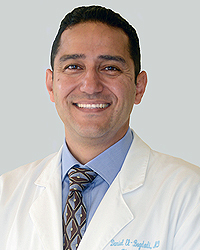 Before joining Arthritis and Rheumatism Associates, Dr. El-Bogdadi practiced rheumatology at both Augusta Health Medical Center and Sentara Rockingham Memorial Hospital in Virginia’s Shenandoah Valley. While there, he also served on the Board of Directors of Augusta Medical Group. Dr. El-Bogdadi is the current President of the DC Rheumatism Society and serves as an Assistant Clinical Professor of Medicine at Georgetown University. He has also served at the American College of Rheumatology (ACR) as a mentor to fellows in training and on the ACR insurance subcommittee. He has also been a spokesman for the Arthritis Foundation’s “Living Your Yes Program” encouraging patients to take control of their arthritis.